Another excellent issue of the Unique Magazine, with Hannes Bok cover and Virgil Finlay illustrations. 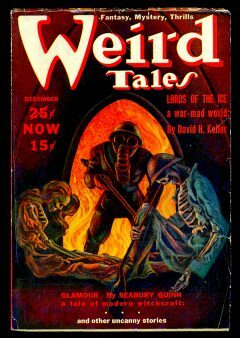 Stories and verse by H. P. Lovecraft, Seabury Quinn, Clark Ashton Smith, Robert Bloch, Frank Belknap Long, and others. The two standouts are “Nymph of Darkness,” a collaboration between C. L. Moore and famous SF fan Forrest J. Ackerman; and “The Copper Bowl,” George Fielding Eliot’s classic of grisly horror. We’ll call this copy Near Fine. Some minor creasing and a couple of small closed tears to the front cover. Complete, blood-red spine. Clean back cover. Lightly yellowed but supple pages.